This small private development is set in landscaped gardens, with a beautiful shared pool set in a lawn area, ideal for adults and youngsters alike. The villa is family-owned, and furnished and maintained to higher standards than more “commercially run” properties. The old town of Nerja, with a fantastic selection of shops, restaurants, bars, and a couple of discos, is close by. The sandy Burriana beach is within walking distance and is well provided with beach bars and restaurants, while other smaller beaches and coves can be found along the shoreline. Supermarkets, car hire, bus stops and taxi services are all within walking distance. When you have had enough of sunbathing, swimming in the pool, relaxing on the beach, and sampling the bars and restaurants there is still plenty do in and around Nerja. Water-sports of all sorts are available - get the details from the tourist office. The area is a paradise for Walkers and nature lovers - the Sierra Alhambra mountains behind the villa are a National Park with great walks, views and wildlife. Newly refurbished in 2018 with traditional Spanish tiles, the bathroom has a walk-in power shower, washbasin and toilet. A separate cloakroom downstairs has a toilet and washbasin. A cold shower is available on the roof terrace - it gets hot up there! Both the Patio garden and roof terrace are private and south facing - perfect for outdoor breakfasts and evening gin and tonics or a barbecue. All rooms have air conditioning and ceiling fans for the summer and heating during the winter months. The pool, gardens and car-park are private, for the use of Jardines de Nerja residents and guests only. Wonderful relaxing stay in very comfortable villa. Very peaceful and just blissful to swim in a lovely clean pool and be able to relax on our own rooftop. 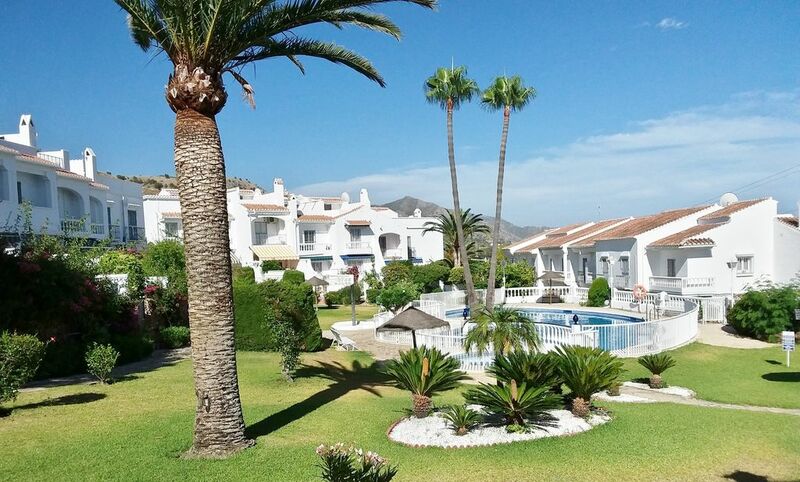 It was a very welcoming property, beautifully landscaped and accessible for Nerja restaurants, beach, Frigiliana and local market. A holiday to remember! Great stay at the apartment, that felt like a home from home that really help make the holiday. Easy to get to from the A-7 and plenty of parking as we had a hire car as we wanted to explore the local area. The apartment was very clean and well presented. The bedrooms air conditioning made pleasant to sleep at night when we were not sitting out on the roof terrace for breakfast, lunch, or enjoying the stars after walking back hill up from an evening meal out. Pool area was clean with 1m to 2m depth suitable for children (there was also a toddler pool. Life guards was present at all times when pool were open,other families enjoying the quiet and relaxing environment. We have holidayed in Nerja on numerous occasions and stayed in various hotels and villas but this was easily the best. The villa was spacious, clean and homely and the air conditioning in the bedrooms was a real bonus. Although we didn't cook much the kitchen was well equipped and had all appliances you might need. The fridge was a good size and there was also a dishwasher and washing machine. The roof terrace was lovely and we spent a lot of time in the evenings star gazing or just chilling out. The pool area is clean and well presented and so quiet even at this time of year. The pool itself is a decent size and never got too busy. There are two decent supermarkets nearby and Burriana beach is a 20 mi ute walk downhill. If you don't like walking taxis are reliable and reasonably priced. There is also a bus down to the beach or into town which costs just 1 Euro. This is hourly but is often slightly late and can get a bit busy in the evenings. All in all we would highly recommend the villa and will definitely return again. Thank you Paul and Sue for allowing us to share your lovely home. We have just returned from a fabulous two week stay at Paul and Sue's villa. We can honestly say that the villa was a massive part of why we enjoyed our trip to Nerja so much. It is homely, with lots of space for our family of four including great outside space. We loved having breakfast on the really private patio in the morning and when possible stealing a few hours to sunbathe on the loungers on the roof terrace. The villa is so well equipped with a full size fridge freezer, a dishwasher and washing machine and everything you need in the kitchen should you wish to cook at home. It is so peaceful and the complex itself is lovely, with access to the communal pool which was always very quiet when we went there. A major bonus is the fantastic air con in the main lounge area and bedrooms which made our stay so comfortable. With the wifi and British TV channels being another bonus! We hired a car though folk we met at the pool were able to get around easily without one so I don't think it's essential though we made trips to The Alhambra, Mini Hollywood, the Nerja Caves and various beaches along the coast so would recommend it if you want to explore Andalucia. The town itself is lovely and we spent many evenings having dinner and ice creams on the Balcon de Europa. Our two fave places were Gusto on Calle Pintada and La Fuente on the Balcon Square. There's also plenty places to eat along Burriana Beach so there's plenty of choice. I would definitely return to the villa. It felt like a home from home and we felt so comfortable there. There's a little mini market a 5 min walk away and a large Mercadona just ten minutes walk. Two minutes in the car. We also went to Aqua Tropic waterpark which is a twenty minute drive away. A great day out for a 4 and 9 year old. So if you want to escape the hum drum of busy hotel resorts and have your own space in a lovely location, this villa is a great choice. Thank you Paul and Sue for a lovely relaxing holiday. My wife and I and our friends had the most wonderful holiday. We have just returned from a weeks idyllic holiday. Thank you Paul and Sue for allowing us to stay in your holiday home, it was just perfect. The setting and the area was fantastic and I am sure we will be back. The pool right outside our door, everything was perfect. Highly recommended. Nerja has been described as the most attractive resort on the Costa del Sol,with a variety of beaches, spectacular mountain ranges coming right down to the coast, and a local planning policy that has avoided a glut of high-rise buildings mean that Nerja has an attraction to everyone. is a parkland course, designed by Jose Maria Canizares. His design offers a challenge to golfers of all levels. Water is a major hazard and is featured at eleven of the holes. Another Canizares course it has been landscaped to make maximum potential of the views of the local mountains, pinewood and the sea, enhanced with lakes and magnificent gardens.